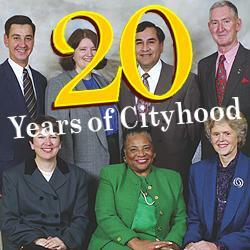 Members of the first council of the brand-new City of Lakewood, 1996. We have a wide range of activities to brighten the grayest days this winter. Whether it's for cake and conversation, celebrating a milestone anniversary for our city, or any of the other events listed below, we sincerely hope you'll join us. Tuesday, January 5th, 10 am-12 noon- Cake Day, at Lakewood Senior Activity Center, 9112 Lakewood Dr SW. Stop by the Society’s table at the Center’s monthly event. Learn more about upcoming programs and events. Saturday, Jan 16th, 10 am-noon- Martin Luther King Jr. Celebration, McGavick Conference Center, Clover Park Technical College, 4500 Steilacoom Blvd SW, Lakewood. Attend the 13th annual celebration highlighting our City’s diversity. Key Note Speaker: Dr. Lonnie Howard, President of Clover Park Technical College. Tuesday, February 23rd, 7 pm- How Our City Came to Be, Lakewood City Hall, Council Chambers, 6000 Main St SW, in Lakewood Towne Center. In celebration of the City’s 20th Birthday, we look back at the incorporation process and the accomplishments made in the last 20 years. Saturday, February 27th, 1 pm – Grand Opening and Ribbon Cutting of Cityhood Exhibit, Lakewood History Museum, 6211 Mt Tacoma Dr SW. Exhibit of Cityhood with updates made in the last 20 years. Tuesday, March 22nd, 7 pm- Stealing Puget Sound,1832-1869, St Mary’s Episcopal Church, 10630 Gravelly Lake Dr SW. Noted educator, author and historian, Dr. Jerry Ramsey, will talk about his latest book, the subject of which is the occupation of Puget Sound by the British. The book will be available for sale with a book signing.